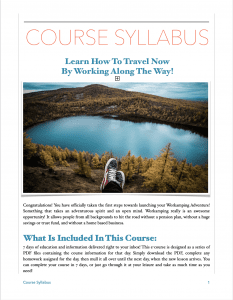 Download your copy of the Course Syllabus and review the descriptions for each day! Grab a pocket folder or small binder to keep all your course information stored in. It doesn’t have to be fancy- just something to keep your information organized. Label the right side ‘NOTES’ and the left side ‘INFO’. Then add your Syllabus to the left side! Join the LiveCampWork Facebook Group and introduce yourself! The group is full of friendly Rvers so make yourself at home! And since you’re already on Facebook, go ahead and like the LiveCampWork Page!